On September 30, 1989 the members of the Marian Anderson String Quartet, then known as the Chaminade Quartet, came together; unaware that they would soon change history. In 1991, the Quartet won the International Cleveland Quartet Competition, becoming the first African American ensemble in history to win a classical music competition. To highlight this singular achievement the members of the quartet asked permission of the great contralto, Marian Anderson, to use her name as their own. Miss Anderson responded with heartfelt approval and, in a memorable show of gratitude, the Marian Anderson String Quartet played for its legendary namesake and her nephew, conductor James DePriest. The Marian Anderson String Quartet’s artistic endeavors have brought them to New York’s Alice Tully Hall, the Corcoran Gallery, the Library of Congress, the Cleveland Institute of Music, Kilbourn Hall, The University of Southern California and the Chateau Cantanac-Brown in Bordeaux, France. The Quartet’s distinguished history includes performances through the Da Camera Society, the San Luis Obispo Mozart Festival and the Chamber Music Society of Lincoln Center. In 1993, the Marian Anderson String Quartet performed at Washington D.C.’s Kennedy Center as part of the 52nd presidential inaugural celebration. 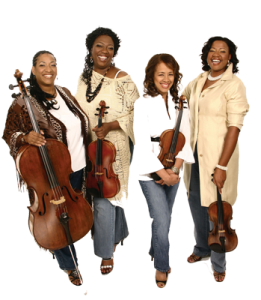 The Marian Anderson String Quartet has been on the faculty of numerous universities throughout the country. They were Quartet in Residence at the City College of New York (1990-1995), and were Ensemble in Residence at California State University- Los Angeles (1995 -1999). In 2001, the Quartet completed a graduate fellowship program at the acclaimed Shepherd School of Music at Rice University in Houston, Texas. 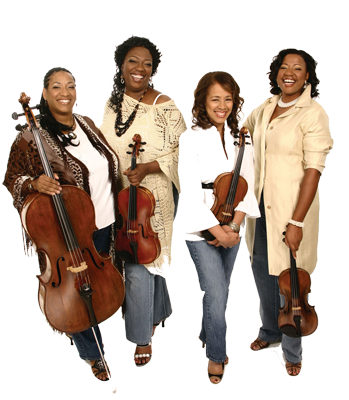 The Marian Anderson String Quartet was the Ensemble in Residence at Prairie View A&M University (2001-2005) and Ensemble in Residence at Texas A&M University in College Station, TX (2001- 2009). The Marian Anderson String Quartet is currently on the faculty of Blinn College in Bryan, TX. University in Providence, Rhode Island. First violinist, Marianne Henry, has toured extensively as a founding member of the Marian Anderson String Quartet. A native of New Orleans, Louisiana, Ms. Henry holds a Bachelor and Master of Music degrees in violin performance, from the Manhattan School of Music in New York City. She received a second Master’s degree in String Quartet Performance at The Shepherd School of Music in Houston, Texas. Ms. Henry is a devoted teacher of violin and chamber music as well as performer. She has served on the faculties of the Harlem School of the Arts in New York City, New York City College and California State University, Lost Angeles. Ms. Henry has been a soloist on KUSC Radio’s “Sundays’ at Four”, a features soloist with the List-Glenn Festival Chamber Orchestra, the South-Central Chamber Orchestra and the Afro American Symphony. She has been involved in a myriad of other orchestra work, which includes Phantom of the Opera, the Academy Award Orchestra, and The American Music Awards. Nicole Cherry, Second Violinist, a native of the Washington DC area discovered her dream job in music after hearing the Marian Anderson String Quartet perform nearly 20 years ago at the world renowned Lincoln Performing Arts Center in New York City. A graduate of the Julliard School with a master of music degree in violin performance, Ms. Cherry performs concerts and educational seminars playing and exploring the essence of European classical music and collaborating with some of the worlds most established artists. Noted as well for her ability to play in many styles, Ms. Cherry has shared the stage with a diverse list of esteemed artists such as members of the Audubon String Quartet, Cleveland String Quartet, Colorado String Quartet and famed pop diva Whitney Houston. Ms. Cherry has also toured internationally, performing and giving presentations throughout the world. In the United Sates, she has performed in such venues as the Library of Congress, the Kennedy Center, Lincoln Center, and Carnegie Hall. Her past performances in Europe, the Middle East, and Asia include a tour as a features soloist in Israel, Egypt, Jordan and South Africa. A founding member of the Marian Anderson String Quartet, dedicated teacher, and eloquent public speaker, violist Diedra Lawrence, has shared her passion for chamber music through both her instrument and the spoken word. A native of New York City, Ms. Lawrence received her Bachelors degree from the Manhattan School of Music and a Masters degree from Rice University’s Shepherd School of Music. She has held teaching positions at the City College of New York, the Bowdoin Music Festival and California State University, Los Angeles. Ms. Lawrence has been a guest artist with the Southwest Chamber Ensemble, performed as a concerto soloist for both the List-Glenn Chamber Music festival and the Symphony Camerata and has perform live on KUSC Radio’s “Sunday s at Four”. She has also been a grant panelist for the Los Angeles Cultural Affairs Department. Prudence McDaniel, a native of Des Moines, Iowa holds a Bachelor of Music degree from Drake University, Master of Music from Manhattan School of Music, and an Artist Diploma from Dequesne University. Ms. McDaniel has performed as a soloist, recitalist, and chamber musician throughout the United States and in Portugal. Through participation in the Minority Orchestral Fellowship Program, Ms. McDaniel was a section cellist with both the Houston and New York Philharmonic Orchestras. She has also been principal cellist with River Cities Symphony Orchestra, West Virginia Symphony Orchestra and an Associate member of the Columbus Symphony.